One helpless Sri Lankan falls prey to killer dengue every 28 minutes now and there is no more space in hospitals for beds. There are not enough nurses and staff. The Government, the municipal services, local administrations, and health services are running out of options and ideas. While the army and the police were called out by the Government along with unprecedented legal threats against the public after dengue became a national danger, the virus-carrying mosquito is on the march. People paying rates to the municipal councils are taken aback by threats from authorities duty bound to keep the cities and towns clean. Experts have been flown in from the World Health Organisation and Australia also pledged money to the WHO to control dengue in Sri Lanka. Municipal sanitation services are yet to be fully functional. Public health inspectors are in short supply, hospitals are overwhelmed. Roadside drains are bubbling with mosquito larvae and insecticide spraying is destroying the mosquito’s natural predators such as dragonflies. This month, 695 cases have been reported every day from across the island. Until Thursday, July 20, 13,886 cases of dengue have been reported in the country. In June, the tally was 22,937. So far this year, 290 people have perished. Dengue patients are also facing deadly bacterial infections such as MRSA in hospital wards. The Sunday Times visited the Colombo North Teaching Hospital in Ragama to see the battle up close. In every bed, there are two patients, some are on the floors and on corridors. The director of the Colombo North Teaching Hospital in Ragama, Dr Shelton Perera said about 410 dengue patients were being treated this past Thursday. Seven have died this month. Until July 15, 32 people have died this year in the hospital. Of these, 28 were patients who had been transferred in critical stages. The hospital had three units and has added three more. It has also has received 30 officials from the army and nine from the Civil Defence Force to help. “Even if we open a new dengue unit we cannot do so due to the lack of skilled staff,’’ Dr Perera said. The hospital needs at least 60 more nurses. Hospital staff are among dengue victims. So far this year 156 staff have been infected. The hospital has 1,460 beds and there is no more space for beds. “It will be unfair if we restrict admissions. The situation in all the hospitals is bad. But even if they are on the floors, at least they are cared for,’’ he said. The hospital is carrying out a triage system and has managed to avoid unnecessary admissions. In Negombo, a mother died from dengue, while her son too was critically ill with the virus. At the Negombo hospital, between 500 and 600 patients are being treated, although there has been a decline from previous months. 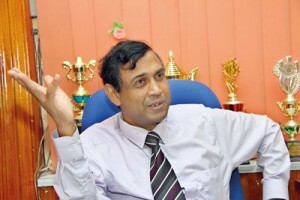 Consultant Pediatrician and Dengue Specialist at the Negombo hospital Dr. Lak Kumar Fernando said the number of dengue patients has dropped to 500-600 in comparison to 600-700 before. He said about that between 30%-40% of dengue patients are children. The dengue unit has 17 beds and 11 beds have been temporarily set up in a nearby eye ward. Each medical ward has 60 beds. And in this hospital, too, there is no more space for beds. In the medical wards and the general paediatric wards two or three patients are being accommodated on one bed. Temporary staff brought in are also not enough. 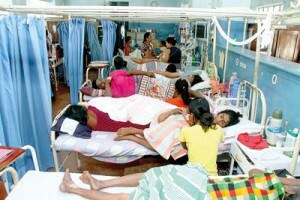 The regional director of health services in Kurunegala, Dr Champa Aluthweera said there have been 6,236 cases this year. Cases are increasing in Polpitigama, Ridigama, Kuliyapitiya,and Pannala. Staff have been called up from district and base hospitals. She said that cases have declined in high risk areas. The regional director of health services in Jaffna, Dr Nanthakumar, said the number of dengue cases is moderate and there has been no increase or decrease. Fewer than 10 cases a day are reported from the teaching and base hospitals. However, he said, in Jaffna and Tellippalai, the number of cases is relatively high. The regional director of health services in Badulla, Dr J C M Tennekoon said the situation has been stable. The regional epidemiologist of the RDHS Batticaloa, Dr Dharshini Murugupillai said: “Batticaloa is a vulnerable area where more cases are reported and clean up programmes are continuing.’’ Dr Murugupillai said clean up programmes should become the norm, not just during crises. 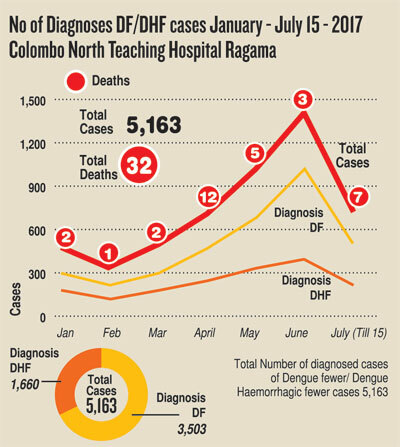 The spokesperson of the Provincial Director of Health Services of Sabaragamuwa, claimed that dengue cases have declined in the absence of rains. “New dengue units have been set up in the hospitals in Balangoda and Kahawatte because there has been a relative increase in cases,’’ he said. 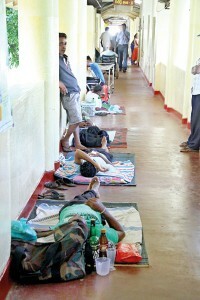 Hospitals are still overflowing with dengue patients.